A translucent solid is not perfectly opaque. Part of the light incident on it penetrates the surface where it undergoes internal scattering and lateral diffusion away from the entry point. Both processes reduce the intensity of reflected light. Because of lateral diffusion, the reflectivity of a translucent solid decreases as the size of the instrument's sample port is reduced. This effect causes systematic errors in measured spectral reflectance factor ("SRF") data. The magnitude of these errors depends on the following: (1) Instrument geometry. (2) Characteristics of sample surface. (3) Sizes of illuminated and measured areas of sample. In commercial spectrophotometers that support diffuse illumination, the entire exposed surface of the sample is illuminated and an optical system controls the area viewed by the detector. Over-illumination is achieved by configuring the viewed area to be smaller than the illuminated area. Experiments in which over-illumination is varied can be used to measure the fractional reflectance losses ("FRL") that result from lateral diffusion. The author recently used this technique to measure FRL values for many ceramic tiles, glasses, and plastics. The X-Rite ColorEye 7000A ("CE7000A") spectrophotometer supports a wide range of over-illumination. Maximum over-illumination is achieved with the LAV/VSAV configuration in which the LAV sample port is combined with the VSAV lens setting. The VSAV/VSAV configuration minimizes over-illumination. The typical FRL results reported below were calculated from SRF data measured using the LAV/VSAV and VSAV/VSAV configurations of a recently purchased CE7000A (S/N 37132651108). The success of this method requires that the instrument's white calibration tile exhibit negligible translucency. This was the case for the author's new CE7000A, but not for his 2nd instrument (S/N 37116190602). 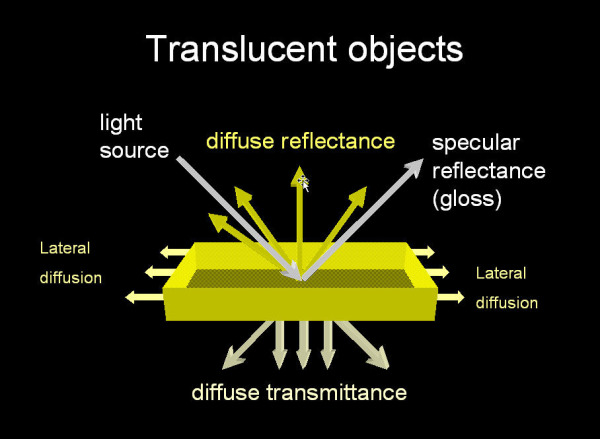 The author's tests demonstrated that many optical materials exhibit translucency. For the FRL values listed below the 2σ standard error of estimate is ± 0.03%. Typical Values: White Carrera® glass, 25.6%. Extruded Teflon®, 22.9%. White Vitrolite® glass, 18.9%. Ceram red-orange 99/1 tile, 8.98%. Sintered PTFE powder (Fluorilon® and Spectralon®), 3.6% - 2.9%. Ceram red tile, 3.14%. MC-20 Russian white opal glass, 3.13%. Ceram orange tile, 3.03%. Ceram yellow tile, 2.52%. X-Rite white calibration tile (S/N 37116190602), 1.43%. Konica-Minolta CMA103 white tile (S/N 18776042), 0.90%. X-Rite white calibration tile (S/N 37132651108), 0.00%. Although FRL values may be measured using other instruments, the results will depend on the translucency of the instrument's white calibration tile as well as the dimensions of its LAV and VSAV sample ports. Comparisons of SRF data measured using instruments with large vs. very small sample ports should be based on opaque transfer standards. If the standards are translucent, inter-instrument agreement cannot be achieved. Instrument profiling cannot mitigate the errors that result from the following sample characteristics: (1) Thermochromism. (2) Translucency. (3) Surface inhomogeneity. The guidelines listed below are based on the sample port sizes of the CE7000A. They are recommended for transfer standards that are used for testing and profiling instruments in the diffuse SCI geometry. The FRL values should be less than 3.5% for instruments that support over-illumination and a LAV, MAV or SAV sample port. For instruments that support a VSAV sample port, the values should not exceed 1.5%.